Booking Aventura Spa Palace Resort packages are an ideal way to maximize your travel dollars, while still enjoying a scenic and luxurious resort vacation. Located about an hour south of Cancun along the Mexico's Maya Riviera, this huge, adults-only resort offers deluxe accommodations, a full menu of spa services and activities, and a spectacular beachfront location. The Aventura Spa Palace features 1266 guest rooms, including 45 suites. All accommodations feature a private balcony (most of which come equipped with a cozy two-person hammock), a double Jacuzzi tub, a stocked (and complimentary) mini-bar and liquor dispenser, and individually-controlled air-conditioning. In addition, all rooms are equipped with a built-in hair dryer, ceiling fans, an in-room safe, a coffeemaker, an alarm clock, and an iron and ironing board. Most rooms offer sweeping sea views. The resort's large full-service spa offers a full menu of relaxing and therapeutic spa treatments. In addition, there is a yoga hut with daily classes, a fitness trail, a soothing indoor swimming pool complete with sound therapy, and a variety of health, beauty, and wellness classes. Among the other facilities at the 85-acre Aventura Spa Palace are a full range of non-motorized watersports (wind-surfing, snorkeling, kayaking, sail boating), three lighted tennis courts, a lagoon-style beach, a lap pool, a yoga hut, indoor swimming pool with sound therapy, a 100-foot climbing tower, a 14-obstacle fitness trail, and a full-service aerobic studio. There's also a unique labyrinth Zen path, designed after a simple one at Chartres Cathedral, outside of Paris. Truly, there is something for everyone. Services offered by the resort include a concierge, a beauty salon, several gift shops and boutiques, a car rental desk, dry cleaning and laundry services, currency exchange, an ATM machine, and wireless Internet service throughout the resort. The Aventura Spa Palace also has a dedicated wedding planning staff to assist with creating the perfect resort wedding or commitment ceremony. The Aventura Spa Palace offers guest seven dining options, ranging from casual to fine dining - all of which are included in the package rates. Choose from Mediterranean, Italian, Oriental, Argentinean, or California cuisines, among others. You can even dine under the stars. For drinks, there's a juice bar, a swim-up pool bar, several pool-side bars, a sweet and coffee bar, and a martini bar in the lounge. Aventura Spa Palace resort is designed for guests aged 18 and older. Packages are all-inclusive. One price includes accommodations, meals, snacks, top shelf drinks, 24-hour room service, non-motorized watersports, nightly live entertainment, WiFi access, and all taxes and gratuities. A current promotion (through mid-December of 2007) also offers unlimited tours of nearby attractions, including the Mayan ruins at Tulum and Chichen Itza, Paradise Snorkeling, Isla Mujeres, and Wet 'n Wild. 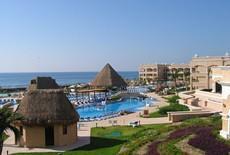 Guests also enjoy exchange privileges with the other Palace resorts in the area. Reservations for Aventura Spa Palace resort packages may be confirmed via their Web site or with your favorite full-service travel agent.